Thank you, everyone, for making my Freshly Pressed post so much fun. What a great Christmas present! As I take a little vacation for the rest of the week, here’s a re-run post so that you don’t forget me too quickly. Learning has nothing to do with age. Why just this year, I have figured out how to write and manage a blog, how to install and use a scanner, how to work my new iPhone – I’ve even downloaded two (count ’em: 2!) apps. 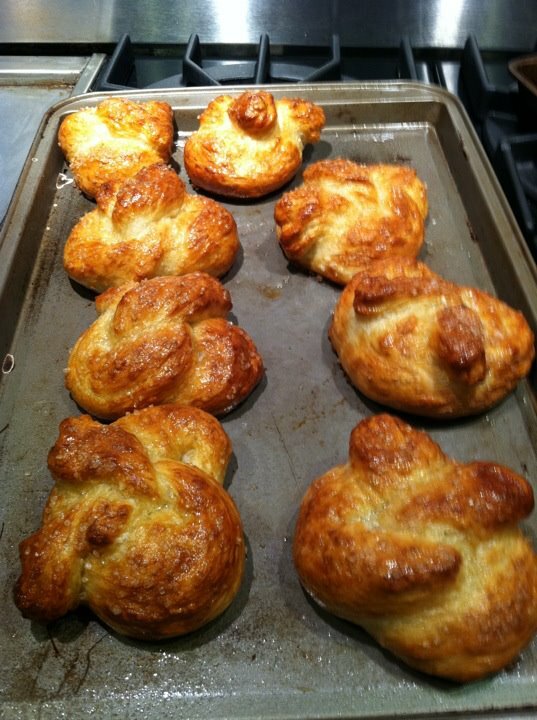 And I learned how to make pretzels. But even though I believe you can learn anything at any age, I will admit that there are some things that are better learned when you’re young. I learned to cross-country ski at age 32, and I did pretty well. Of course, cross-country skiing is sort of like how you skated across the kitchen floor in your stocking feet when you were eight. And there’s nothing to be afraid of. If I come across a steep descent, I just snap my boots out of my skis and walk around it. But at age 37, I met a man who ‘ski’ skied. Like downhill. Downhill skiing isn’t really downhill, it’s downmountain. So I went to a medium-sized local mountain with this man and his son. I persuaded Boyfriend not to watch me, and so he happily went to the black diamond hill with his eleven-year-old. I rented boots, skis, and poles, and inched my way to the instruction slope. ‘Slope’ was an exaggeration. The grade was about the same as the floor of my shower, so that the water runs into the drain. But I was cool gliding down the gentle path with the rest of my class. The rest of my class were toddlers. I was pleased by this, since I thought by ‘tippy’, he might mean ‘stacked’, and that made me like my new ski jacket quite a bit. After about half of hour of easy practice, I graduated. I went to the bunny hill. I had to get on the little ski-lift and take a short ride. Getting off was very brave. and then I made slow, wide (almost horizontal) zig-zags down the hill. My boyfriend showed up and I did it again with him. I was very pleased with myself. And I had that little tag on my jacket that told the world I was a skier. It was exhilarating. We broke up the next week. The following year I met the man who became my husband. And unbelievably, he was another skier! But okay, I could tell him that I skied ‘a little’. More unbelievably, he seemed to be in love with me. He planned a ski vacation, and when I told him I would rent equipment, his smitten little self took me to the local ski shop and bought me skis, boots, poles, goggles, and an even cuter ski jacket with matching pants, mittens and headband. I was a doll. So we go to a REAL mountain in Vermont. I donned my new ensemble and we headed for a very big ski lift and a very tall mountain. Only it was called The Bunny Hill. “This can’t be the bunny hill,” I told my sweetheart. And I got to the top and fell off the ski lift. “I’m okay,” I said cheerfully. And we started down. DOWN. My boots hurt, I couldn’t control my direction, and I was unable to make those big sideways swaths I had learned the previous year. I went straight downhill like a racer, only with my poles flailing like cockeyed windmills. For about thirty feet. I managed to stop by using my face as a brake. After I got my head out of the snow, I sat down and cried a little bit. My sweetie tried to coax me back on my feet, and I cried harder. “Can’t I take my skis off and walk down?” I asked. Eventually we took it little by little, and he guided me slowly down the mountain. I skied all the way down in snowplow position. Which is exhausting. And I didn’t ski again. And he married me anyway. But I learned to ski as an adult. So don’t be telling me you can’t teach an old dog new tricks! P.S. – I’m no coward. Why just this morning I brushed my teeth with that lethal weapon called the Spinbrush. I really needed a good belly laugh this morning…thank you! Thanks. I am glad I don’t have to ski anymore. “And I managed to stop by using my face as a brake.” HA HA HA! I would not recommend face-braking as a regular technique. Nancy, Skier #2 got lucky! Happy new year to you. Oh he’s lucky and I am too! Twenty-one years so far and so far, so good. Congrats on the FP! Happy new year! Thanks. Happy New Year to you too, Maineiac! Ha ha. Indeed you ARE a fast learner. BTW, Congratulations on your FP. Awesome! Thanks – I especially appreciate my earliest blogging friends – and you are at the top of the list! The perfect Freshly Pressed followup — because I’m presuming that your face was pretty freshly pressed into that snow. How do I know that? 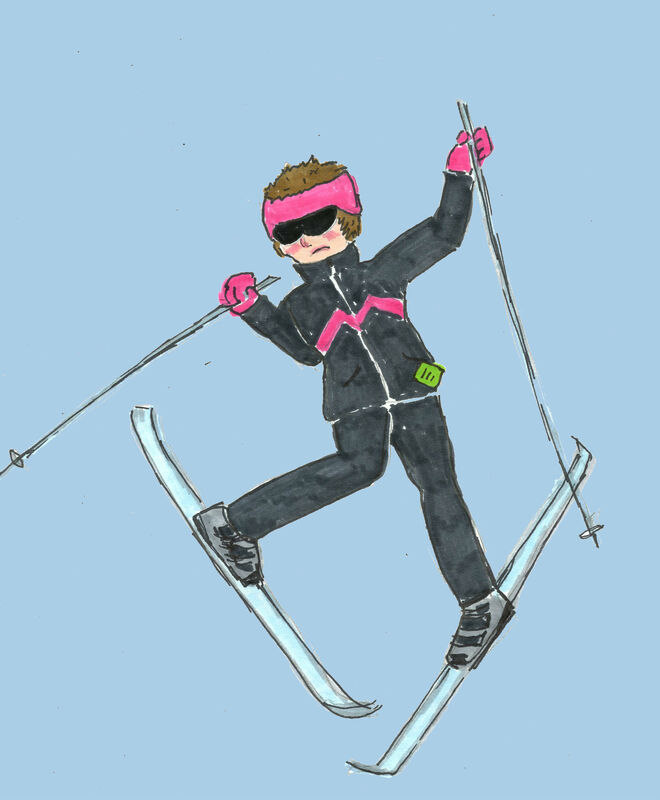 I tried to learn to ski at 40 when I moved to Switzerland. Anyone who skis is just asking for it. I roared with laughter at the face brake part! Great post. Thanks. I can only laugh now – 22 years later. Congrats on FP. Well deserved! A funny post. Remembering the Joan Rivers line that she doesn’t participate in any sport where there’s an ambulance waiting at the bottom for casualties. Thanks for the morning laugh. That’s a very good criteria. The presence of an ambulance should be a signal. You know how to use an i phone?!? That is awesome and I am not worthy! Thanks…. I wrote this a while back. Now I have THREE apps! The face brake line is grand! I could feel my cheeks being relieved of a layer or two of skin…ouch. I, too, learned to ski at the advanced age of 41 and was never able to get knees and hips to work in tandem; they fought each other all the way to the bottom of the hill. So, if anyone asks, I can legitimately choke out, “Ski? Sure I do.” Thanks for sharing a great post. Yeah! You and I can SKI! I heard a kinda joke once. Newby skier says ” first time on the slope. I broke the course record” of course the guys lying — Soo lets try a somewhat more believable story: She’s pretty and athletic and had been on the college ski team. “Let’s go to Vail” she invited. I’ll teach you how to ski. Now, I had a tiny bit of experience with barrel staves and flat belting nailed to the sides in a loop to put my farm boots into. I attached a stick to baling wire and my brother would pull me behind the silage wagon to the trench silo through the pasture. This is not downhill skiing! but it is tricky– on the farm in Kansas our nearest/only ski experience is every four years watching winter olympics. That’s where I learned slalom and a little hop to the side spraying snow everywhere to stop at the bottom. Top of Vail: I think at about 40 feet off the lift- I better fall down and make this look good. She’s just cracking up watching me struggle to stand up again. (( The key: go like hell and pretend I’m a skier)) Ok , Girl, take off , I’ll follow. She stops halfway down Vail, brooding , mad, Where’d you learn to ski!!?? Cautious, timid, I, I went to Brighton for a couple hours last weekend- whoa, she’s mad. A few minutes later she blasts over a rise to a drop off and I follow. Ooh, Noo, she’d led me onto a double black diamond and it’s vertical and a quarter mile down to the Lodge. Ok, I fell down for real. I’m glad that I brought back some good memories for you. When I 1st met my husband, he left Boston a month later to ski bum in Colorado. I went out to visit. Never much of a skier myself, he brought me cross country skiing to the hot springs in Steamboat. We lost track of the time, lounging in the warm, steamy water, admiring the scenery. On the return trip to town, the trail was icy, I lost control on a slight downhill. I ended up spending the night in the Steamboat hospital with a butterfly fracture to my tib-fib. I returned to Boston in a toe to crotch cast. He stayed behind but cut his ski bum winter short. We continued to date for several years with a few more bumps and detours along the road but married and had 2 daughters who learned to ski very young. Their Dad taught them while Mom rode the mahogany rail at the ski lodge, sipping wine and reading a book. Our oldest daughter has now dropped out of college and is a ski bum in Steamboat Springs, Colorado. I’m not sure where I’m going with this story but thanks for kick starting the memory. I see a character for another book developing already. Wait, you aren’t supposed to use your face as a brake? No wonder I never liked to ski. Congratulations on being Freshly Pressed! Well done and well deserved! I’ll now take skiing off my bucket list; you’ve confirmed what my inner voice feared! But the outfit sounds lovely. Who says you have to do everything anyway. I love your sense of humor and the way you look at the world! It’s life, and there is no point in taking it seriously all the time (or maybe most of the time?). After all, none of us are getting out of here alive so why not enjoy it while we can? Lots of grins. Snowplow is exhausting – but it works. May the new year bring you much laughter and wonder! You are much braver than me. I tried on my friends skis in his living room. Fell over and never tried again. Those pretzels look mighty good, though. I might have to learn how to make those.